The Boat is a book of short stories, authored by Nam Le, which has been extensively used in education to stimulate discussions and elicit challenges about the way Senior students (aged 15 and up) might think about concepts such as war, refugees, resilience, family, intercultural perspectives and more. Extensive teaching guides are available via AustLit & Reading Australia. As a text, it is powerful, and critics admire how Le writes with authenticity across a variety of worldviews and experiences. Using a combination of illustration and movie-making techniques, the online story draws the reader in, as they scroll down at their own pace, immersed in a soundscape that engages the senses and following text that flows across the screen like the ocean the boat is traversing. Experience it here. As a librarian, this is what I imagine ebooks truly should be. 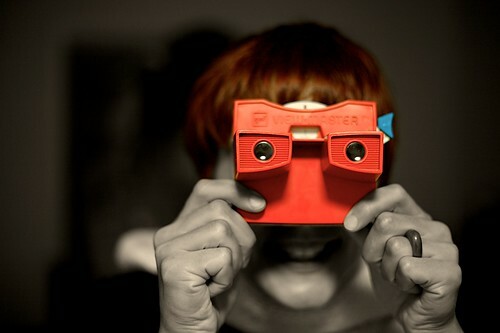 To use Puentedura‘s terms – this is not just a substitution – backlit text on an electronic page – but something that reimagines and redefines storytelling and the experience of story, taking advantage of flexibility in form and function, and drawing together word, image, animation and sound. it is clear to see that this style of publishing requires a whole new literacy to be taught to students. No longer just dealing with alphabetic fonts on a static page, readers must move with the text in a non-linear way – sometimes fading into dreams which feature a collage of line drawing and historical photo, then returning to the main storyline, simultaneously combining their understanding of the interplay of many different forms of expression. Screengrab from ‘The Boat’ – click image to access the site. Will there be more re-imaginings of the ebook, and even more interactive and engaging stories being shared via changing technologies? I hope so. I also hope that educators continue to deepen their definition of literacy, so that students are able to not just consume, but begin to create innovations such as this. The shape of texts to come by Jon Callow as well as the work of Anstey and Bull are great places for teachers to begin exploring multiliteracies and the development of visual literacy. Another avenue to explore is that of graphic novels – the format which shapes The Boat – as complex, stand-alone plotlines are developed using text and sequential art. You can read more about the potential of graphic novels in the classroom in this recent ResourceLink blog post, Getting Graphic. So please, take the time to explore ‘The Boat’ – both interactive and traditional versions. Introduce it to your students (even younger students can access the story as retold on the site); and consider how literacy has changed, is changing, and the impact this has on your practice. Share your thoughts below! A few weeks ago I was fortunate enough to be invited to St Oliver Plunkett to be a part of their 1-1 iPad rollout to the very excited Year 6 class. Led by their fabulous teacher librarian, Ann-Marie Furber and fearless class teacher, Brooke Maguire, with consultation from the very dedicated and talented Education Officer Learning and Teaching Technologies, Danielle Carter, the Year 6 class participated in a series of workshops in order to develop their skills before they were officially given management of their very own devices. While the school maintains ownership, the students manage the purchasing of additional apps, and the care and maintenance of the iPads for the time they are at the school. This means the students have 24-7 access to their learning. The rollout has been a carefully managed process, with a great deal of professional development and pre-planning being done before the students had access to the devices. The bootcamp itself was a terrific opportunity to work with a group of enthusiastic and excited Year 6 students. The workshops they participated in dealt with simple tips and tricks for managing their iPad, Email etiquette, run by Ann-Marie Furber, Teacher Librarian, Successful Searching, run by classroom teacher Brooke Maguire and Copyright and Creative Commons, run by myself, Kay Cantwell, Education Officer Digital Learning. 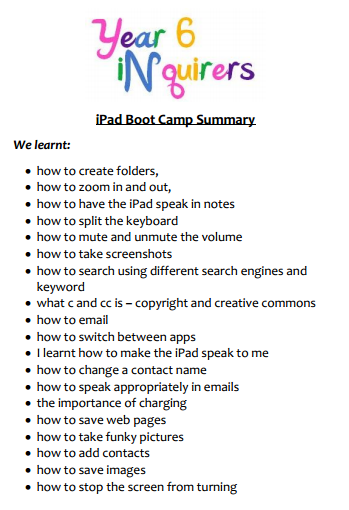 Once the students had completed these workshops, they were officially licensed to take ‘ownership’ of their devices. Evidence of the planning undertaken prior to this 1-1 rollout was the well established resources that had been developed in order to maximise student learning. 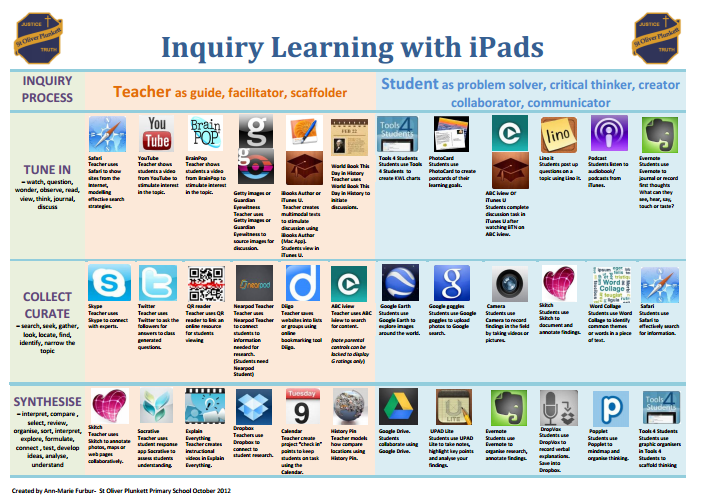 Rather than be overwhelmed with apps, or being seduced by limited, content focused apps that had all of the bells and whistles but little quality pedagogy, lists of Core Student and Core Teacher apps were developed, as well as a list of apps suitable for Inquiry Learning. This, along with a ‘workflow wall’ which creates a visual list of apps the students need to access in order to complete a task, allows students to make use of their iPad as a tool, rather than as a source of low level learning or as a time filler activity and games device. & that we are the class to be chosen is pretty cool. I give today a five because we had lots of learning opportunities and it was totally AWESOME!!!!!!!! I give today a 5/5 because it was a very good learning experience for me. Thank you to all the teachers for making it a great day! I’m sure the 1-1 iPad rollout at St Oliver Plunkett is going to be a huge success – due to the careful planning, the focus on learning, and the fact that the iPads are not being viewed as the be-all and end-all, but just another (albeit incredibly powerful) tool for the students to utilise in their learning journey. See below for the Copyright Resource that I created to help the Year 6’s begin to understand the crazy complexities of copyright, and the potential of Creative Commons. With a content creation tool such as the iPad at their fingertips, it is vital that the students know how to access resources that they have permission to use when creating multimodal works. Link to the Presentation and Booklet. The 2012 Horizon Report identifies mobile devices and tablet computing as technologies expected to enter mainstream use in education within one year or less. The mobility of these devices, their almost instant accessibility, the ease with which the touch screens promote interaction and the huge range of educational apps available for very reasonable prices appeal to both teachers and students. Research has found that the use of iPads and other mobile devices in the classroom improves engagement, supports multiple ways to access the curriculum and enhances assessment practices (Government of Alberta, 3 October 2011). The flexibility of mobile devices is undeniable. They have been successfully rolled out in 1-1 programmes, where students have 24/7 access to the devices, and have equally been found to be powerful learning tools when used in a one to many scenario. In fact, Kristin Redington Bennett says in her recent article, Less Than a Class Set , that having fewer iPads not only challenged teachers to be more creative and innovative in the way they designed learning opportunities, but also that having a small number of iPads in a classroom facilitated individualized and tailored instruction, as a class set of the devices may encourage more traditional whole class instruction. This scenario, of having one iPad shared among multiple users is likely to be far more common that the 1-1 scenario in most schools, as the technology is still relatively new, and education budgets grow increasingly tight. Often, it is the school library which manages the mobile devices, loaning them out to teachers and classes on a needs basis. 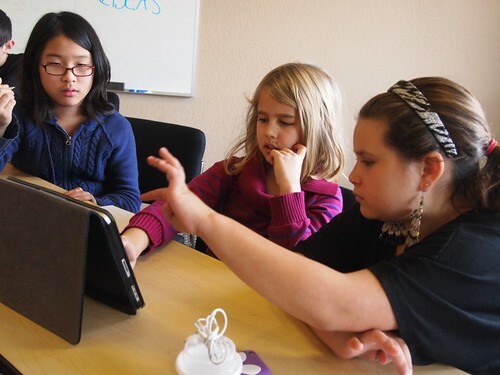 Sharing iPads among whole classes and small groups can still lead to effective learning. As Bennett suggests, the teacher may use one iPad with the whole class as a moveable digital display, moving around the classroom with it, or having the students pass the tablet around. It may also be the focus of a small group challenge, or as a part of a learning centre. They can be used by individual students for extension, or provide engaging practise for students who are struggling with specific concepts. Apps such as Futaba, which allow multiple students to play together on the iPad are also terrific options, and the list of these multiplayer apps is growing. The iPad is designed primarily as a personal device. Apple in particular has had massive success in the education market; with sales data in the United States finding that in the most recent quarter, iPads even outsold Personal Computers in the K-12 Market. Despite this success, and the enthusiastic take up by teachers and students, the iPad’s design remains that of a personal device. This provides a range of challenges to educators who are using the device as a shared technology between multiple users. In May 2012, Apple Insider reported that the lack of multi-user support on iPad is a ‘known issue,’ which was ‘being investigated’ by Apple. While there are apps that allow multiple users to access different accounts such as Facebook or cloud based document libraries, there is no way for multiple users to have their own personalised profile in the way that users can log into a shared PC. This would be useful in situations where teachers and students share the device, as the teacher could have a profile that allows them to access their emails, class and assessment data, teaching apps etc, while students could log into a generic ‘student’ account, which provides access to educational apps and a student email for exporting from apps. Deploying multiple iPads to a generic user base is one of the most challenging aspects of their introduction to schools. The initial set up of multiple devices can be extremely time-consuming. 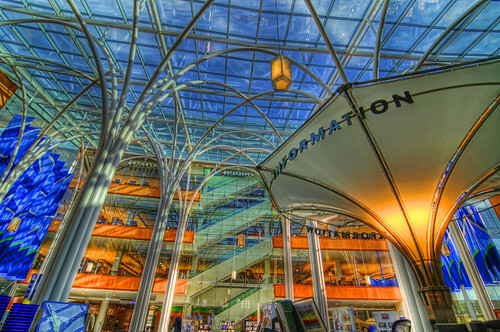 There are ways to deliver email access, wireless network and other functions over the air, strategies which are detailed in Apple’s business solutions package, however the establishment of the Apple ID required for each device takes some time, particularly entering in the numerous details required by Apple’s strict security. The Apple Configurator app goes some way to simplify the process also (although this requires a Mac computer), however all of these options require not only an administrator with a fairly good basic set of IT skills, but also a robust WiFi network or the time needed to plug each device into a central (Mac) computer. None of this should (or indeed does) dissuade schools from adopting these mobile devices; however they are good things to be aware of for any school looking to move into the mobile device area; deployment takes time and skills. Managing iPads in a one to one setting is much simpler, as each student is able to manage the download of the apps they require. In situations where the device is shared, the process is a little more complex. It was with great joy that Australian educators received the news that we finally had access to the Volume purchasing program for apps that had been available in the United States for several years. This makes purchasing large numbers of apps and installing them far more manageable. Previously, to abide by licensing requirements, apps had to be purchased individually for each device, and then installed in this manner. The volume purchasing program, although somewhat tedious to set up, allows for the purchase of multiple apps with one credit card (although sadly, not with an iTunes card, which is how schools commonly manage the financial aspect of purchasing). A distribution code is then made available, which is then used on each device to download the app from the iTunes store. While this makes management easier, the code must still be physically entered on each individual device – which may take some time for 60 devices. Students can easily do this process, but for younger users, teachers may prefer to manage this process themselves. Not every app is a part of this program; app creators must nominate for their app to be included. For those apps which are not available through volume purchasing, individual purchases are still required. Syncing and/or charging multiple devices is possible through the use of a professionally created solution, however for those with limited budgets, ideas on home-made docking stations are available. Mobile devices continue to grow in their influence in education. As time passes, they are becoming easier to manage on a school basis, and hopefully these improvements will continue to develop. In the meantime, schools looking at managing multiple devices should be aware of the time this requires, and plan strategically in order to get the best out of their investment. 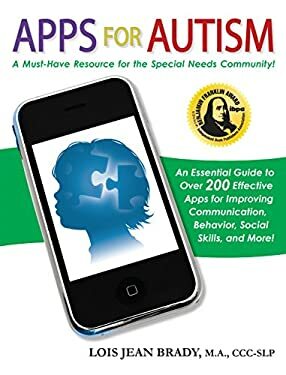 Apps for Autism – new resources to explore! We have experts within our Brisbane community also. Recently my colleague Ben van Trier and I were privileged to attend a training session with Bronwyn Sutton, a well known Brisbane-based Speech Therapist, who has a particular interest in Early Intervention, and has done extensive research in identifying a large range of apps that are useful when working with children who are on the Autistic Spectrum Disorder. Her book, Apps for autism and learning : making an informed choice is also available to staff of BCE through the ResourceLink library. One of the features of Bronwyn’s research is that she has an Australian focus, and so wherever possible, she suggests apps that are either developed in Australia or that are not distractingly accented. Bronwyn suggests that when working with students with Autism, the device is used either as a learning tool or a gaming device, as these students do not always have the cognitive flexibility and impulse control to resist the simple click required to access a game. Also, the ease to close an app is tempting for students with impulse control issues – for students with these challenges, she suggests using BubCaps, which make the button more difficult to click on and off. One of the key messages that Ben and I took away from Bronwyn’s workshop was that with the huge number of apps available, effective evaluation of apps is vital. Available to borrow through the ResourcLink library, or to purchase through Amazon (click the image to access details). 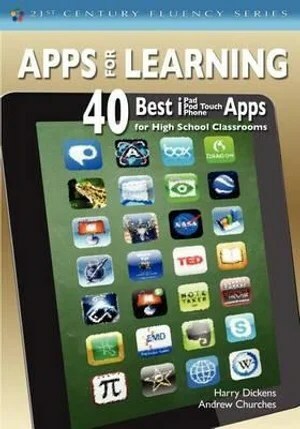 While quality titles exist that go some way to provide lists of useful apps, such as Apps for learning : 40 best iPad/iPod Touch/iPhone apps for high school classrooms by Harry Dickens and Andrew Churches. The difficulty with books is that they are dated from the moment they are printed. Therefore, it might be more useful for teachers and schools to develop their own evaluation tools, which can be applied to apps as they are discovered. The next post on the ResourceLink blog will explore the process of evaluating iOS apps for iPads and iPod touches, and provide some frameworks and strategies for implementing this process into your school or current practice. The flexibility of mobile devices is without doubt what affords them their great potential. Whether you have a 1:1 tablet arrangement, a bank devices or a single device per class, there are many possibilities for creative use. 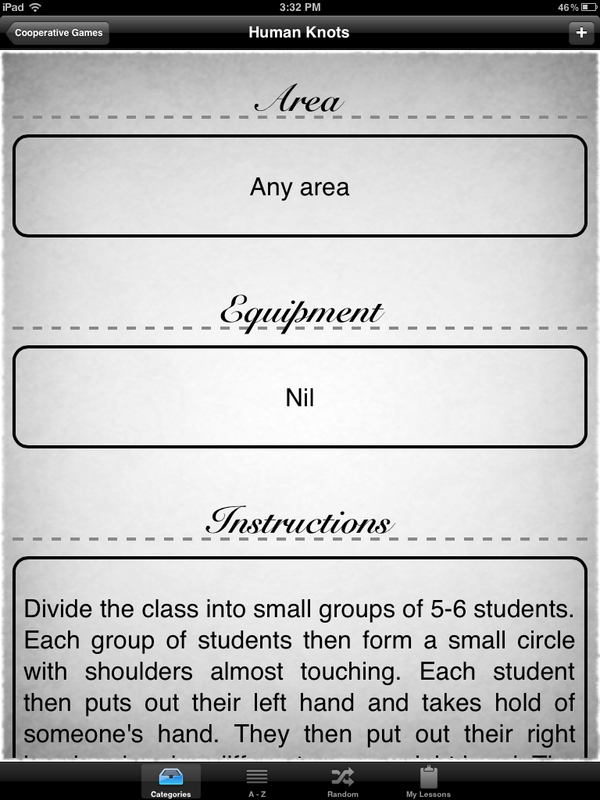 A mobile learner takes advantage of this flexibility; they use it individually, with a buddy and in groups, taking it to where the learning is – to the playground, to the library, on the excursion – and using it in a variety of ways – as a source of information, as a tool for recording learning, as a method of expression or a channel for collaboration. This post aims to exemplify just some of these modes of use. ‘enables teachers to design, develop, and integrate digital learning experiences that utilize technology to transform learning experiences to lead to high levels of achievement for students’ (Beyond Substitution, 2011). 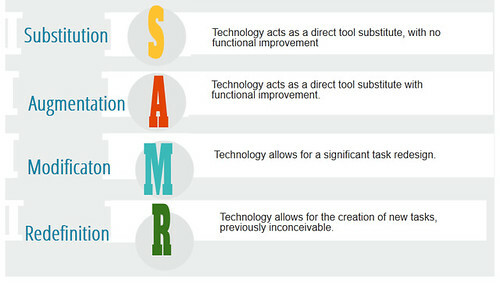 SAMR, a model designed to help educators integrate technology into teaching and learning , was developed by Dr. Ruben Puentedura. While this model is excellent in encouraging teachers to imagine creative new ways to engage students in constructing new understandings, it also provides a place for apps that simply present more traditional teaching strategies in innovative ways. The key as always is balance – and the seamless use of technology – so that it does not dominate the learning but merely enables it. 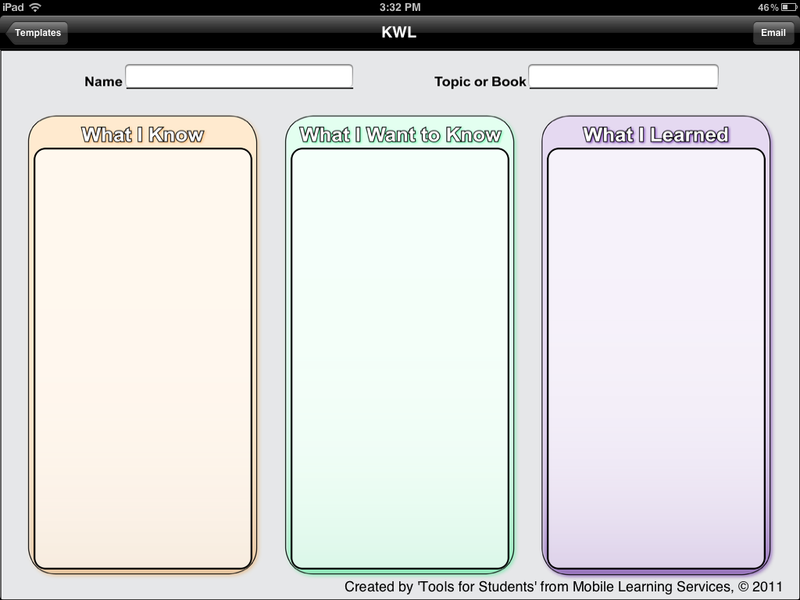 Just as picking up a pencil does not disrupt the ‘flow’ of a lesson, but just enables the student to record their learning, so too should opening up an app on a mobile device not be the focus of the lesson, but just the process through which students access the information or learning opportunity. The presentation below ‘A Day in the Life of a Mobile Learner’ seeks to present the many ways a mobile device (in this scenario, an iPad) could be used throughout a ‘typical’ day for a student in the middle years of primary school. 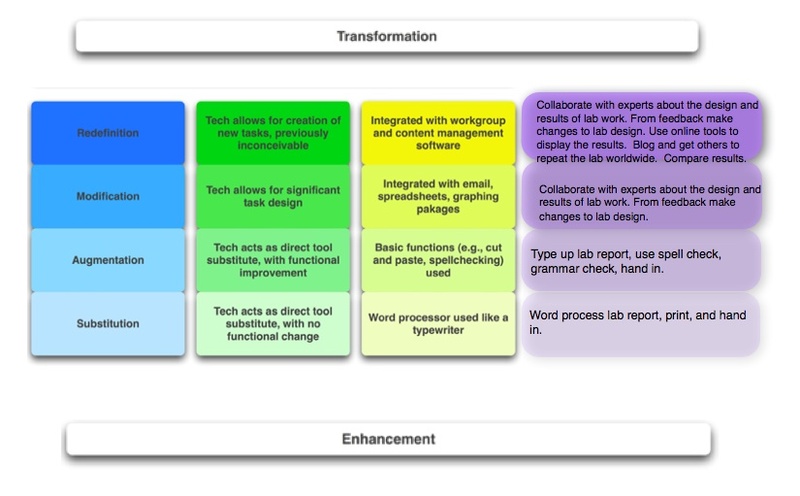 Below the presentation is a more detailed account of the day, with suggestion as to how each of the activities fit within the SAMR model, to enhance understanding of how the model looks in action. If you cannot view the Prezi (above) please use this link. The app images link directly to the page where you can download these apps. For other useful teaching apps, check out the ResourceLink Pinterest board for apps. Kid A goes to the school library, and borrows an iPad from the ‘Gadget Garage’. He then chooses ‘Fred and Ted’s Road Trip’ to download onto the Overdrive Media Console. When the bell rings, he returns the book on Overdrive, and then returns the iPad, before moving to class. First up Kid A participates in Literacy Block. Kid A participates in a number of different activities. The first thing Kid A does is practise his morning talk with a buddy. He recorded the talk using Dragon Dictation, and then pasted the text into the the VisioPrompt app, which converts the iPad into a teleprompter. Having his talk on the teleprompter enables him to feel more comfortable when talking in front of the class, and also gives additional reading practise. This is an example of Augmentation, as the apps allow Kid A to do the same task (morning talk) but with functional improvement. 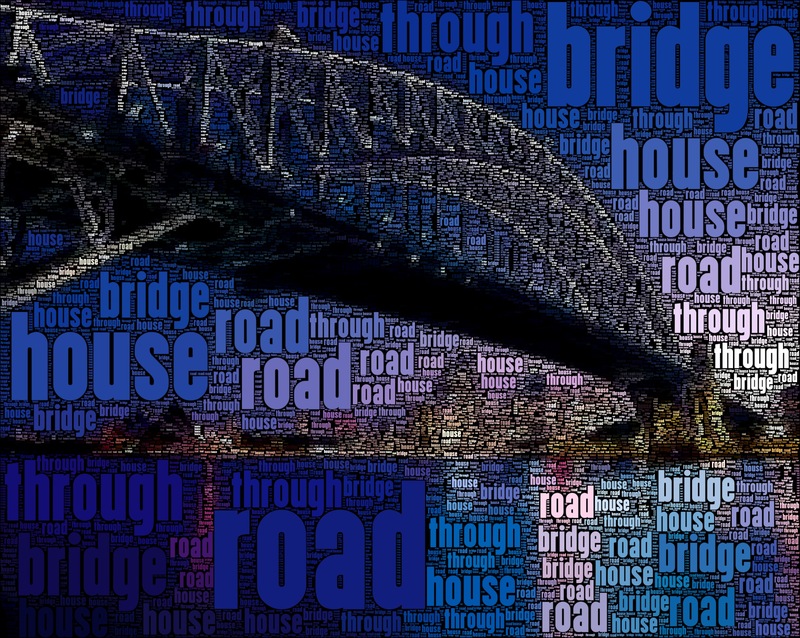 Kid A has a spelling list of words that he practises by typing into WordFoto. The act of typing the words in and searching for a picture that connects or represents the words helps Kid A remember them better. When he completes his wordfoto, he places the picture into the Dropbox app, so that his teacher can print it out later for him to take home. Having a visual stimulus assists Kid A and encourages him to spend more time practising his spelling words. This is an example of Modification – although the task of recalling spelling words is the same, the method used is significantly modified by the Wordfoto app. Kid A now joins with three classmates and plays Futaba, using the pre-prepared list of vocabulary words and images his group compiled the previous week. Futaba is unique, as it allows four students to participate in a game using the one iPad simultaneously. 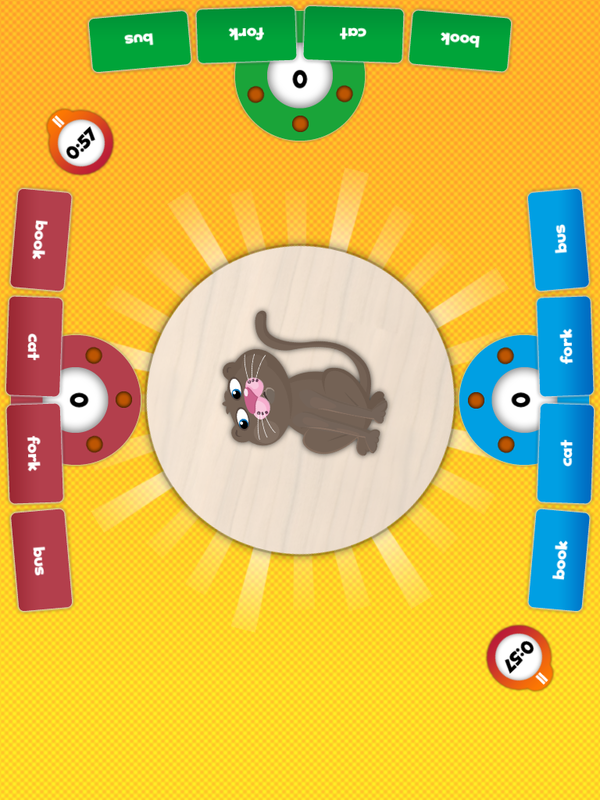 This is an example of Substitution, as there have always been word games that students have played where they match words with images – the iPad in this case simply provides a different channel for delivering the game. Next week, the students in Kid A’s class will be exploring the instructional text type of recipes. 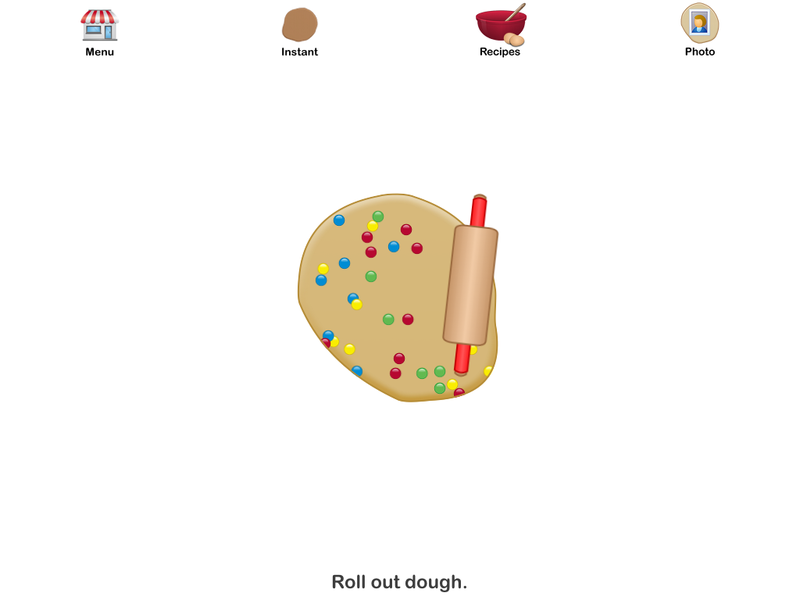 In preparation for this, Kid A works through the Cookie Doodle app, reading each stage of the recipe and noting the verbs used at the beginning of each instruction. The Cookie Doodle app is an example of Redefinition – the task is redefined through the use of this app, as it allows a level of interactivity with the recipe that would only otherwise be possible through actually cooking. After morning tea, Kid A starts his maths rotations. During this time, he works individually and in groups, completing number skill activities and also more open ended problem solving tasks. First, Kid A practises his ‘add to 10’ skills, playing the game Mathris, a number facts game based on Tetris. (Substitution). 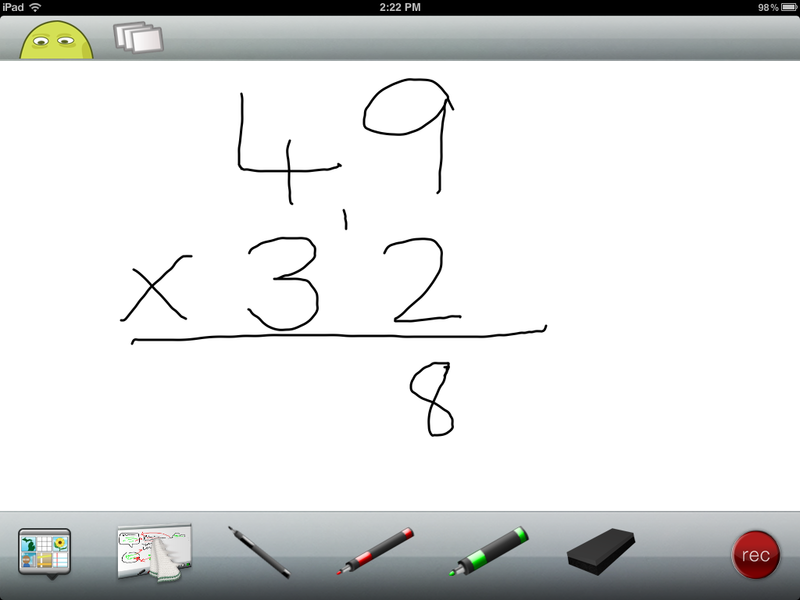 Working with a partner, Kid A then uses ScreenChomp to develop an explanation of how to multiply by two digit numbers. This whiteboard app records the verbal explanation and the writing on the screen and converts it to a video, which Kid A emails to his teacher. The video forms an excellent piece of evidence for the teacher in assessing Kid A’s understanding of multiplication. It also allows the teacher to pinpoint if and where there are any difficulties (i.e. if Kid A needs more practise with basic maths facts, or in remembering the strategy for multiplying double digits etc). 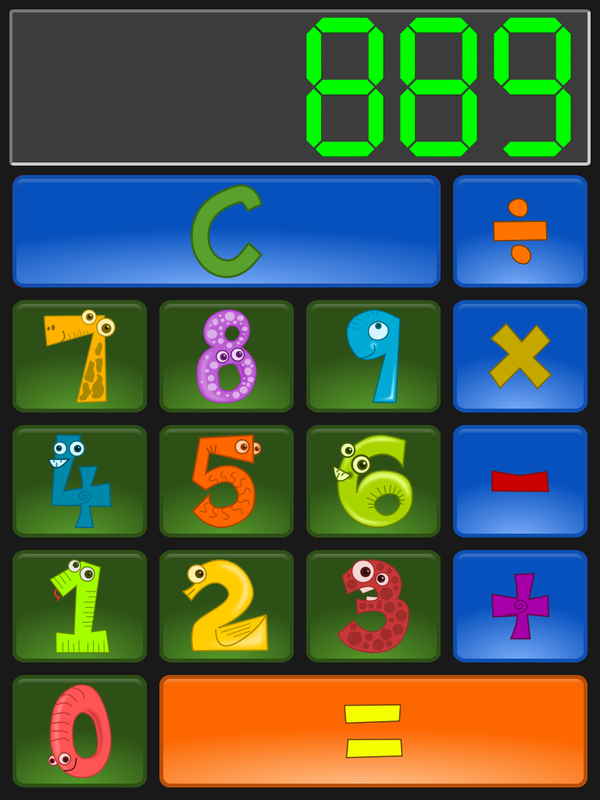 Previously this opportunity to watch and listen as a child explains the process of completing an equation was limited, as teachers did not have the time to sit one on one with every child – therefore this is an example of Modification – the app provides data gathering in a way that was previously extremely difficult. To wind up their maths rotations, Kid A leads a whole class game invented by the teacher, using the speaking calculator app. 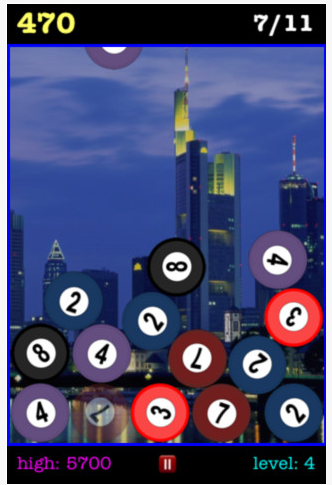 Another example of Augmentation, as the presence of the app allows for a functional improvement on previous games using calculators, by the presence of the ‘speaking’ feature. Time for the class to begin working on their integrated unit, which is one on sustainability. The class is exploring ways that they can change their school environment so that it better reflects principles of sustainability. They begin with a simple ‘substitution’ exercise – working in small groups to complete a KWL graphic organiser on the iPad, using the Tools 4 Students app. This is emailed to the teacher for later use in a whole class activity. Next, Kid A buddies up with a friend, and walks around the school, using the iPad to take photos of parts of the playground where they think environmental practices could be implemented. 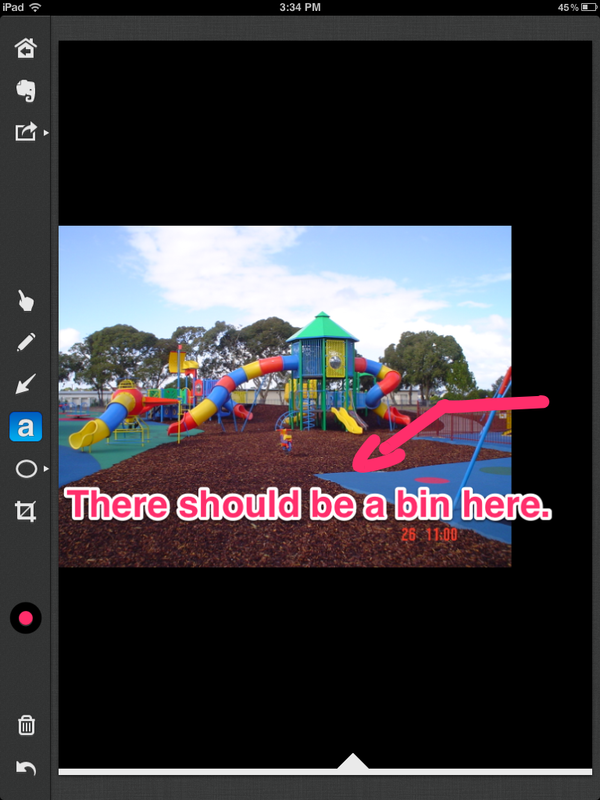 They return to the classroom, and use the Skitch app to annotate their photos, explaining why they took the photo and what change they believe is needed. This combination of activities is an example of Modification – although it could previously have been completed using a digital camera and pen and paper, the use of the iPad camera and Skitch app have made the learning far more about the process rather than the tools. Finally, the class adds the finishing touches to a display for their upcoming parent morning. This display is two-fold. Firstly, the students wrote poems about the school environment, and published them as posters for the classroom walls. 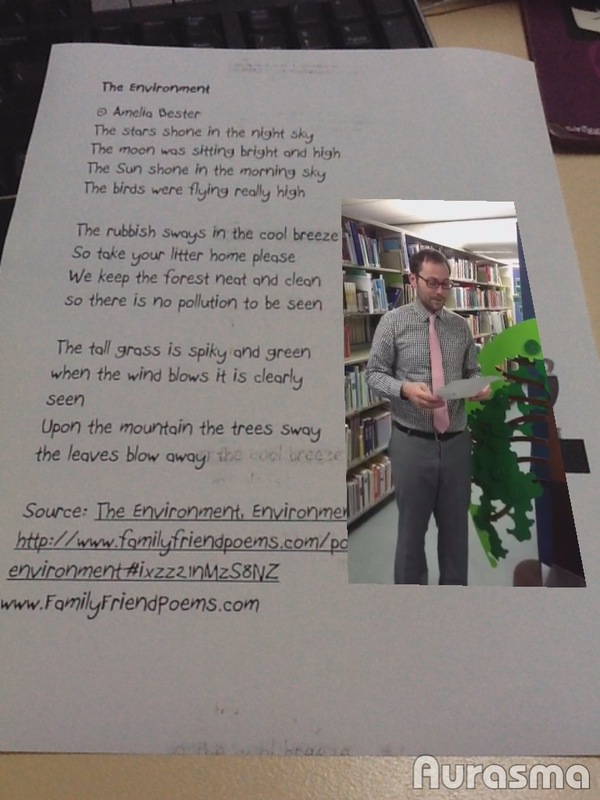 They then recited these poems to the class, while a classmate recorded their presentation using the video recorder on the iPad. Today, the students use the Aurasma Lite app to attach the video to the posters, so that parents can view through the Aurasma app and see their recitations. 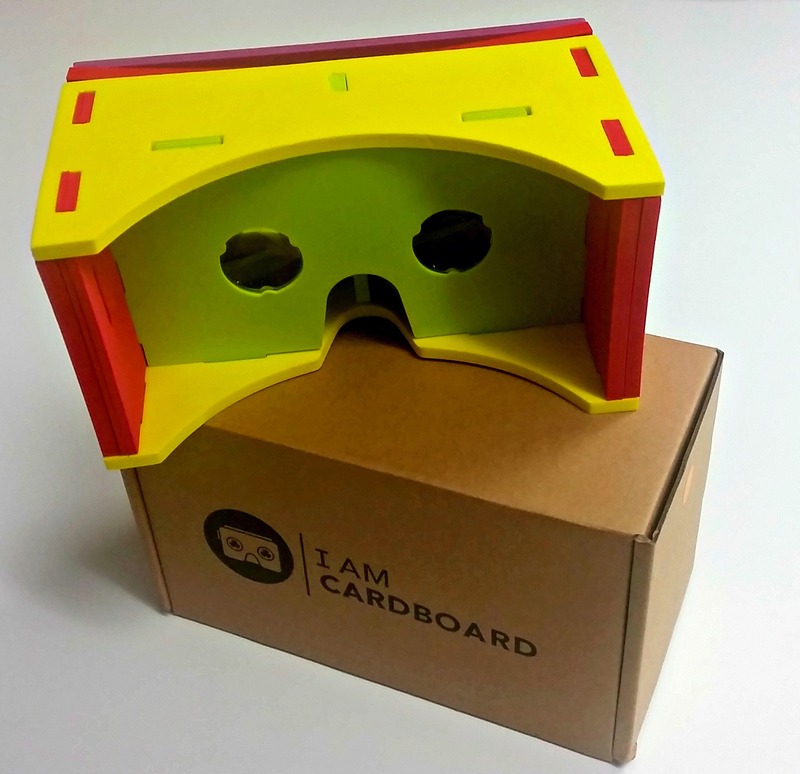 This is an example of Augmented Reality, and is definitely a task that falls into the Redefinition category of the SAMR model, as it was not in any way possible prior to the use of augmented reality apps in the classroom. 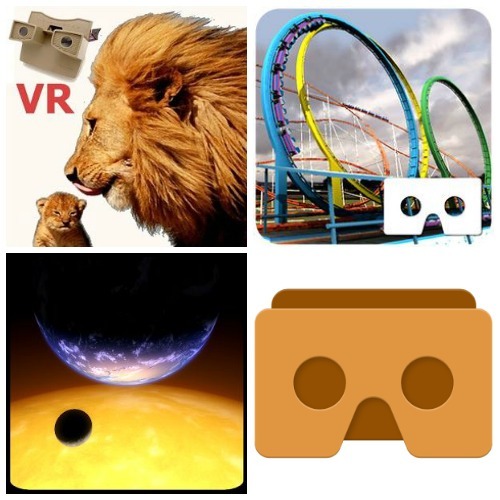 Further information on Augmented Reality and augmented reality apps will be featured in an upcoming blog post, so if this activity has intrigued you, stay tuned! The afternoon session brings Health and Physical Education and Art. The HPE and Art activities are simple examples of how basic substitution apps such as PE Games and FacesiMake can be used in creative ways that encourage higher order thinking and collaboration skills. The PE Games app is essentially a HPE Games book that is accessible on the iPad. The flexibility comes from being able to add your own games to the ones already included. Students can be encouraged to work collaboratively by providing them with access to the app and the required resources (e.g. balls, hoops, beanbags), and asking them to work together to understand and play a game that is randomly chosen by shaking the iPad/iPod touch gently. 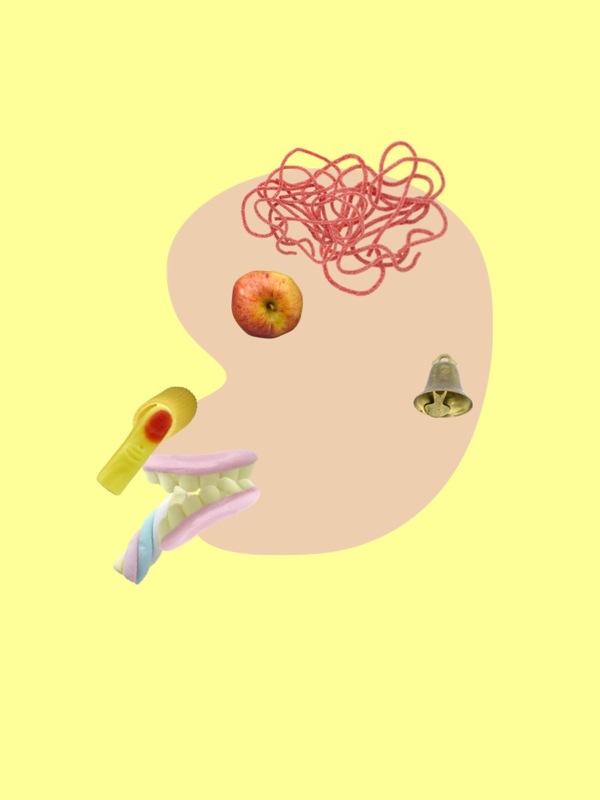 The FacesiMake app allows students to exercise creativity in designing a face using innumerable number of items, including pieces of fruit, household implements, stationary items…the options are endless. Suggesting that students use this app to create a new character for a story that they are to write, or to imitate a famous work of art adds another layer to what is essentially a very fun and non-messy way of creating unique images of faces. Kid A’s day is over too soon! He has never been as engaged, and during the day, he has worked independently, in partnership with his buddy and in small groups, as well as in whole class settings. He can’t wait to see what apps he might use tomorrow…but that is a blog post for another day!